Review: ‘True Legend’ – The Nuge. Those of us who spend our precious free time watching the special features on a DVD or Blu-Ray, patiently trawling over the behind-the-scenes material in the all-too-often-vain hope of gleaning some insider info or on-set gems of wisdom, will likely be familiar with the name Yuen Woo-Ping. Known in Asia for directing high-intensity action movies since Hong Kong’s 1970s boom (where he gave a young Jackie Chan his first big break), Yuen came to prominence in the West when he was hired to choreograph the mind-blowing action in The Matrix, and his extraordinary ‘wire-fu’ techniques had centre-stage in the accompanying feature-length DVD extra The Matrix Revisited. Since then he has made a name for himself in Hollywood as the go-to guy for choreographing jaw-dropping martial arts-based action, his face popping up in the DVD extras for Kill Bill Vol 1 & 2, Fearless, Kung Fu Hustle, The Forbidden Kingdom, Crouching Tiger, Hidden Dragon Matrix and the sequels. This year ‘the Master’ returned to his native China and the director’s chair for the first time in nearly fifteen years to make True Legend, an old school sort of Asian action film which could have been made in the seventies. It has a slick twenty-first century skin, but a ruggedly twentieth century B-movie skeleton lurks beneath, and all the better that it does. Like the best of its ilk, True Legend sets itself somewhere in China’s eventful history, here during the Qing Dynasty, and the opening titles note that “it is a turbulent time.” (If you go by Asian cinema, it has always been a turbulent time in China.) 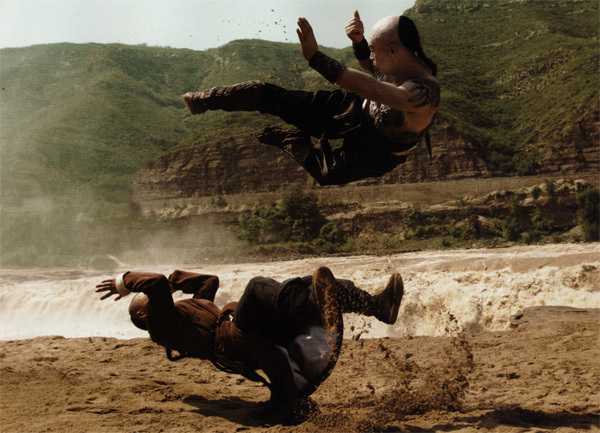 From minute one we are thrown into the action which made Yeun’s name famous, a combination of epic battles and martial arts with astonishing scale and impact. The breathtaking opening sequences introduce our hero Su Can (Vincent Zhao) as he leads a daring rescue mission to save a Prince from a mountainous fortress. With impossible stunts, huge sprawling sets and hundreds of extras, the calibre of action in these opening ten minutes alone could easily trump anything Hollywood has offered this year, in scale or spectacle. His mission successful, Su Can rejects his offer of promotion and chooses to lead a quiet life with his family. Here the film begins to falter slightly, as the perennial weak-script-in-a-good-action-movie syndrome sets in. Yeun, in common with action directors the world over, can’t really direct a decent dialogue-heavy scene as well as he can a fighting-heavy one. The main body of the plot, a stock tale of bloody sibling revenge, is fine, if fairly conventional. The script has some awful lines, though, perhaps sounding cheesier in translation. “One life is connected to many hearts” – er, what? Meanwhile, Su Can’s treacherous brother Ying (Zhou Xun), his skin greying in order to achieve the ‘Five Finger Fist’, has an almost pantomimic streak of villainy in him. All of this is largely forgivable, to be accepted in the context of the film’s lovable B-movie roots; less forgivable is the somewhat superfluous final act. True Legend doesn’t end where you think it should – when the baddie is defeated – but instead drags on towards its nearly two hour running time detailing Su Can’s decline into homelessness and habitual drinking as he ultimately invents and perfects the famous ‘Drunken Fist’ technique. Apparently based on a real life character, this origins story may hold some significance for Asian audiences or martial arts devotees but for everyone else the last half hour is surprisingly wearisome. A short cameo from the late great David Carradine, repaying the favour from Kill Bill, is a saving grace. Still, it’s worth a watch. There is some epic, balletic fighting to enjoy, a marvellous bit of 3D action (complete with retro ‘put on your 3D glasses now’ messages) and some great Rocky-style training montages. True Legend failed to ignite the Chinese box office and it will have trouble finding an audience over here beyond the usual geeky aficianados but with ‘the Master’ at the helm, it deserves to be seen.